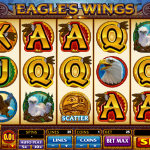 Eagles Wings is an all American video slot coming from Microgaming. The main symbol in the slot is the American Bald Eagle and his life in the natural habitat. The game has a few native details which give it an attractive look, as well as great symbol details and choice of colors. Still this is an older Microgaming slot so the animations are on a low level. 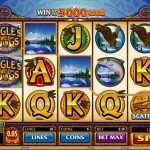 But as in most other slot games the visual details are in second plan and the most attractive detail are the payouts and the bonus features which Eagle Wings has to offer. The special features in the slot start with the wild symbol. In this slot the wild will substitute for all other symbols except the scatter and can land stacked across the reels. Furthermore he will double any payout he contributes in. The scatter symbol in the slot is the Eagle Wings Golden Coin. Once three or more of them land on the reels the free spins bonus is triggered. All payouts in the bonus round will be multiplied by x3, but before the free spins start you will need to make picks among the Golden Coins. You can make as many picks as the number of triggering symbols. The maximum number of free spins you can win in this bonus round is limited to 60. If another set of three or more Golden Coins lands during the bonus round you will be awarded the same number of triggering free spins. 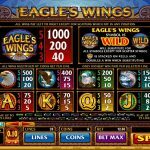 Eagles Wings is still a popular slot across Microgaming casinos. The reason for this can be found in the bonus round. Since all payouts with a wild are doubled and the wild can land stacked, during the free spins all payouts with a wild will have a x6 multiplier, because of the tripled payouts. This is why Eagle Wings can produce great payouts during the bonus feature. For all of you dog lover… you should consider playing Dogfather a 5 reel slot by MicroGaming.